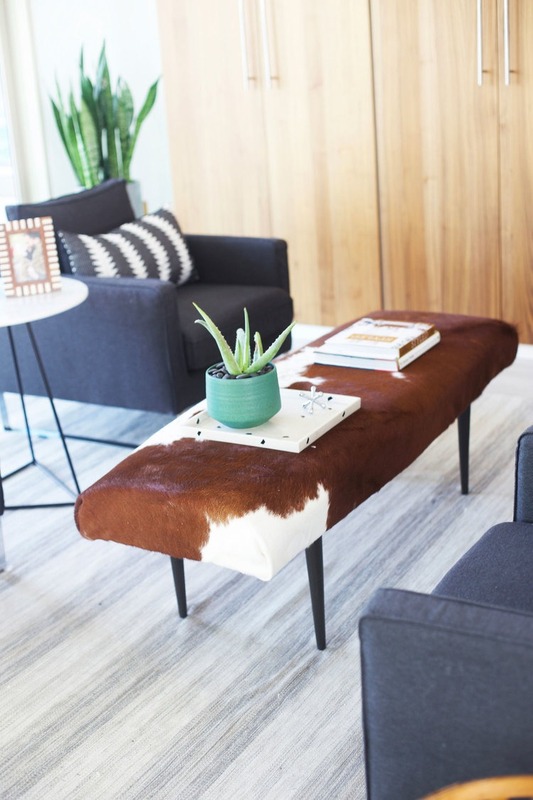 Designing a new home on a budget can be hard – you put so much money down on the house, and then had to buy essentials when you moved in, and it just feels like that gorgeous leather ottoman is perfect for your new living room but you’ll never have the money. Fear not! DIYers to the rescue! We found 11 amazing DIY projects that look luxe and high-end but are actually IKEA hacks underneath it all. Check them out! Designer Malcolm Begg took a couple IKEA Billy bookcases and with a little planning and muscle, put together this gorgeous hanging bookshelf arrangement. You definitely wouldn’t have to go as far as crown molding and beadboard trim like he did, but you could get a very similar effect in your house on an IKEA-sized budget. It’s hard to find the perfect desk or the perfect accent piece especially when you see a handful of things that you wish you could just combine or even afford. These creative DIYers did just that. 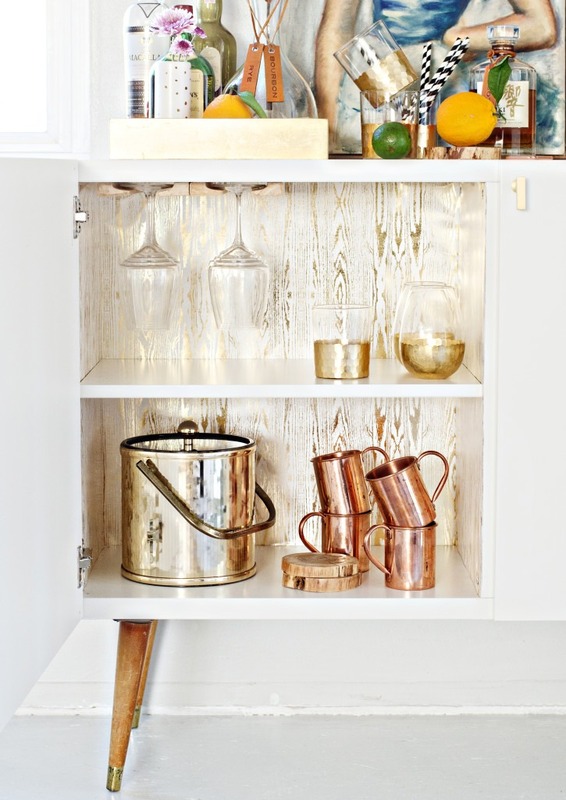 Brittany, a creator and designer out of California, kept seeing vintage bar cabinets that didn’t quite fit her style or her budget, so she took the project into her own hands. With an IKEA Besta cabinet, a few vintage legs and gold accents, Brittany put together this luxurious mid-mod bar cabinet in just a weekend. 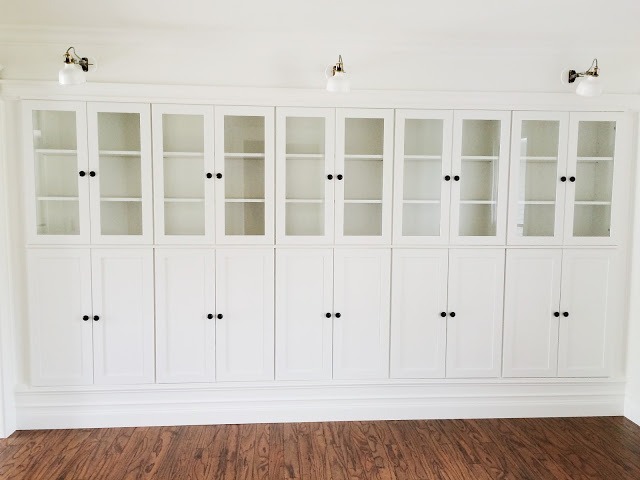 We love this one because the form of the IKEA piece didn’t change, but the modifications to it were so subtle and thoughtful that the entire cabinet was transformed… for $150! We love this one for how absolutely simple it is. 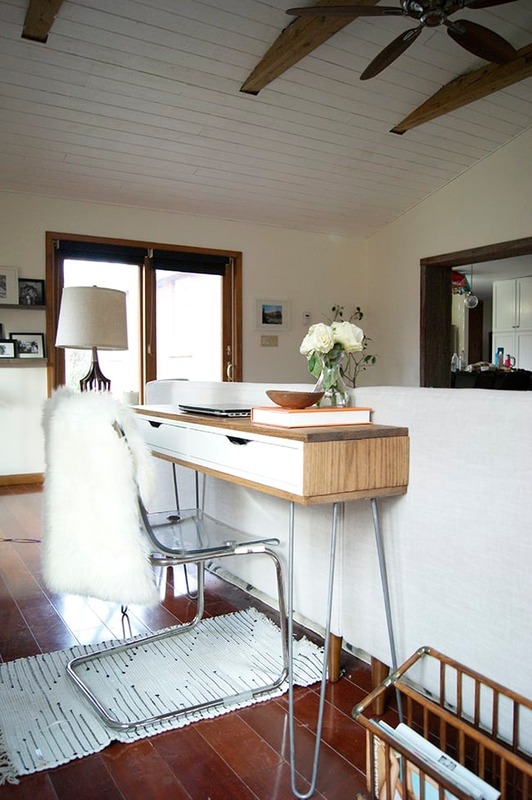 Lauren, from Undeclared Panache, built a minimalist sofa-table-slash-desk in a weekend by wrapping an IKEA Ekby Alex shelf in highly-finished wood. The hairpin legs add a touch of industrialism. You could feasibly wrap any IKEA piece in any wood or texture for a similar effect. Faux alligator skin, anyone? How incredible would that be?! They say a room is created by the details in it, not the large focal points. Here are some interesting little side pieces you can do by yourself in an afternoon. 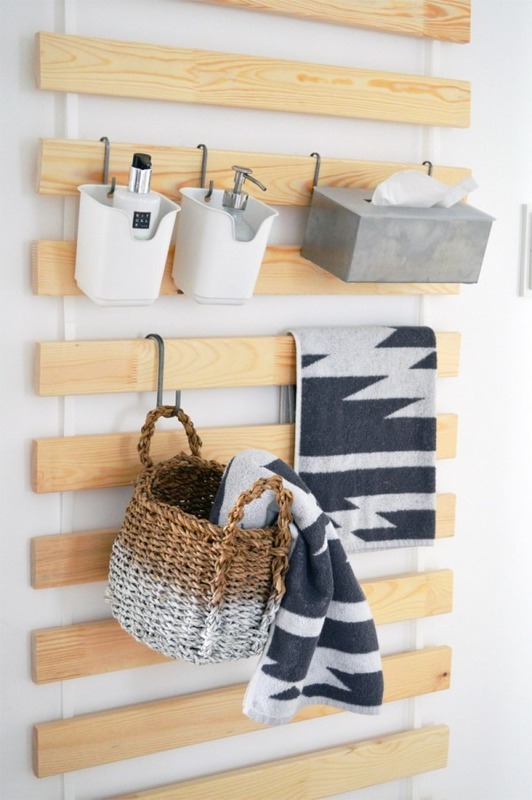 Kristina, from ICH DESIGNER, had a wild idea: she pulled the support slats from an IKEA Luröy bed and hung them on the wall for a mix-up version of wall shelving. In her post, she shows several uses, from bathroom accessories like above to an office center to kids’ playroom storage. Katrina was refinishing her kids’ bathroom and ran into a lighting problem. 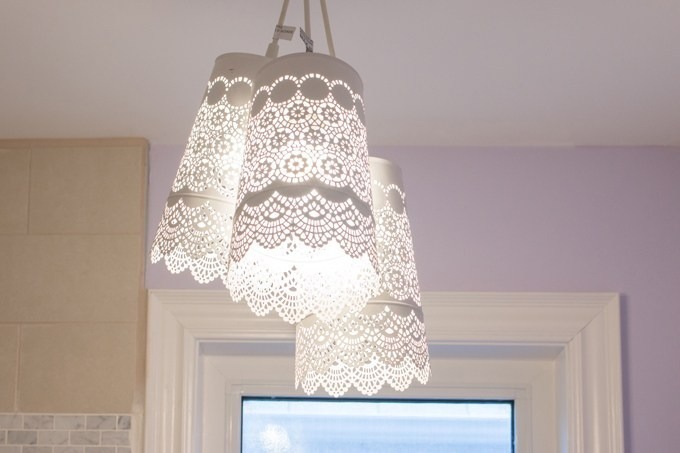 With a little creativity, she turned three IKEA candle holders (and a $15 pendant lamp, also from IKEA) upside down into a lacy pendant chandelier. 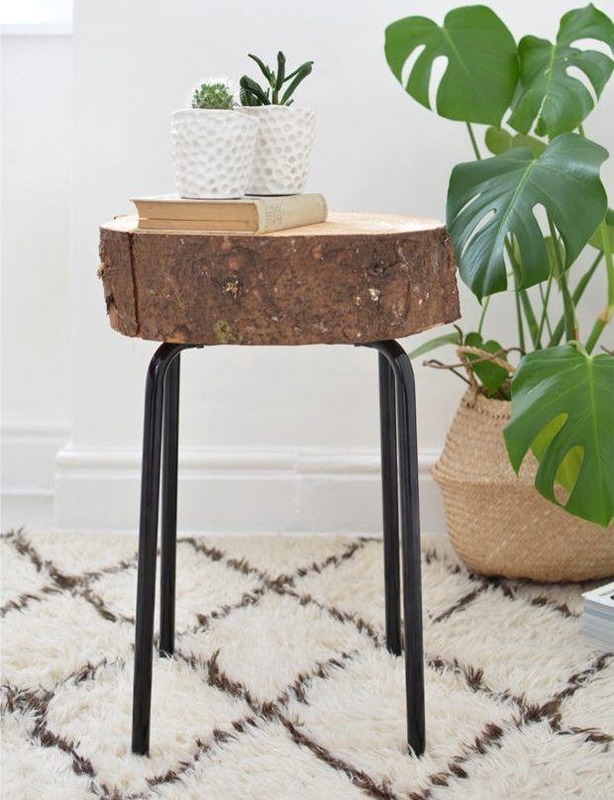 Finding the perfect little side table always seems to be the hardest part of a room, doesn’t it? Maybe follow this example and DIY your own! This is an IKEA Marius stool with a thick round of raw wood in place of the seat. Imagine what you could do with a round marble cheese tray, some gold spray paint, or even a jagged slab of stone scrap from a countertop company! We love this little hack for how versatile it is – change out the glassware, change out the paint, change out the stones/soil/fill, put in succulents instead of herbs, spray paint the holder the color your heart desires – there are so many combinations waiting to happen! 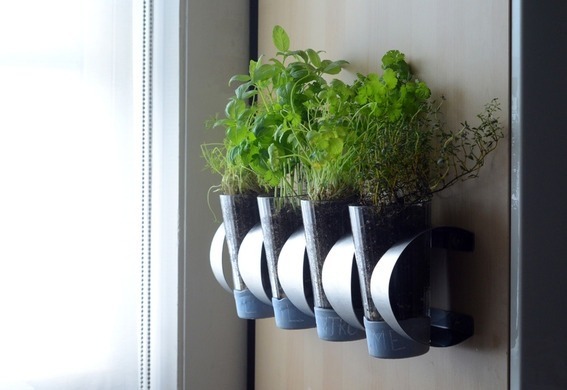 Faith used an IKEA Vurm wine holder and a handful of glasses she collected to build a wall-mounted indoor herb garden. In all our research on this collection, one thing became very very clear: any IKEA piece can be transformed if you paint it white and/or replace the fixtures with gold. Look at the Pinterest results! Gold handles on a white chest, or gold handles on a black chest… if you’re going for a luxury finish, high polish and gold accents are the way to go. What IKEA furniture have you hacked? Which projects have you been dying to tackle? Share them with us in the comments! Obsessed With IKEA? Why Not Just Buy This Home?